The DWMF Idea Board | Dude, Where's My Freedom? Posted on February 12, 2013	by Dude Where's My Freedom? Behold! The DWMF “Idea Board.” Just as some fun little insight, I thought I’d share how exactly I keep track of topics I plan on addressing in the future. Sure, I could use a higher-tech method, but some sort of electronic file stored on my computer would only be accessed when I have cause to look at it. 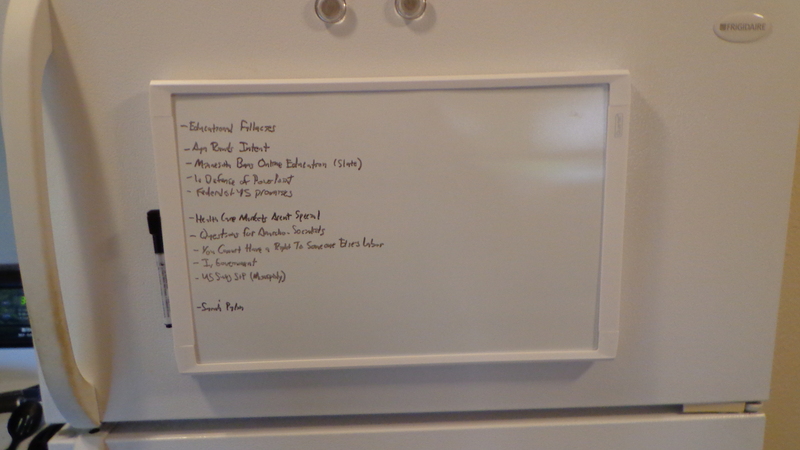 By keeping this right on my refrigerator, I get reminded of these topics every time I visit the kitchen, allowing me to refine my thoughts and think about what I want to write on a near-constant basis. This entry was posted in General and tagged behind the scenes, ideas. Bookmark the permalink.